The medium-sized black hole is one of just three spotted in our galaxy. Astronomers recently spotted an invisible, interstellar nomad wandering throughout the Milky Way. 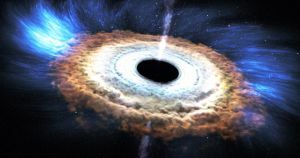 More specifically, scientists working at the National Astronomical Observatory of Japan (NAOJ) found evidence of rare type of black hole, according to research published on the preprint server ArXiv in December. If the scientists are correct, that would make this Jupiter-sized black hole the third of its kind in our entire galaxy, New Scientist reports. The team never actually saw the black hole because it’s, well, a black hole. But what they did see was a traveling cloud of celestial gases orbiting around something using a network of Chilean telescopes called the Atacama Large Millimeter/submillimeter Array, according to Space.com. “When I checked the ALMA data for the first time, I was really excited because the observed gas showed obvious orbital motions, which strongly suggest an invisible massive object lurking,” Shunya Takekawa, an astrophysicist at the NAOJ told New Scientist. Based on how that gas cloud was moving orbiting its central point, the team determined that the newly-discovered black hole is about 3,000 times more massive than our Sun — but so compact that it takes up about as much space as Jupiter, according to the research. Since about 1,000 planets the size of Jupiter could fit into the Sun, that makes this new black hole 3 million times more dense than the Sun. Scientists have a much better understanding of the common, comparatively tiny black holes born of collapsed stars, as well as the supermassive black holes at the center of the Milky Way. Ultimately, this discovery opens the door to the possibility that there are many more medium-sized black holes wandering the Milky Way. Now that astronomers know to keep their eyes out for clouds of spiraling gas, other teams may soon find more and more of these bizarre and rare black holes.